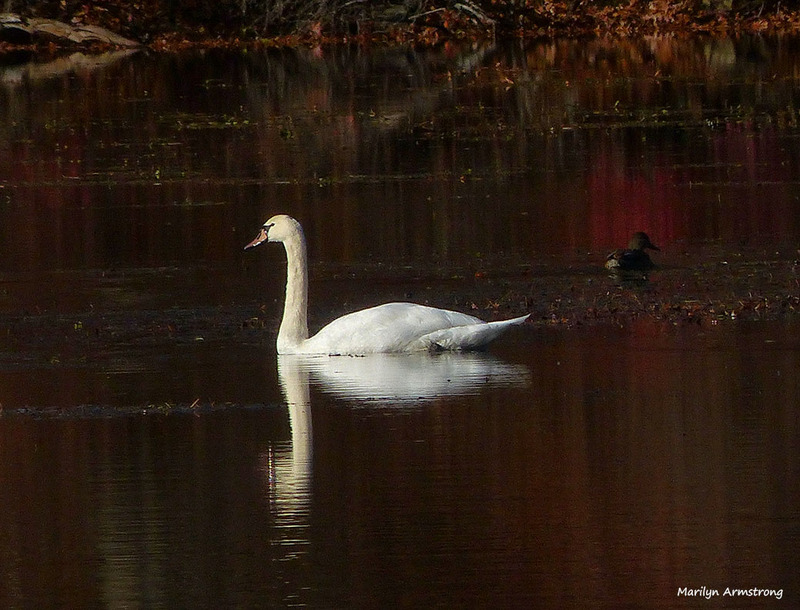 I haven’t seen any swans around here at all in months. The local ponds, rivers, waterfalls were all dry, with their muddy bottoms showing. Kaity tells me she’s seen a lot of swans, but not in the usual places. I assume they went to deeper water. 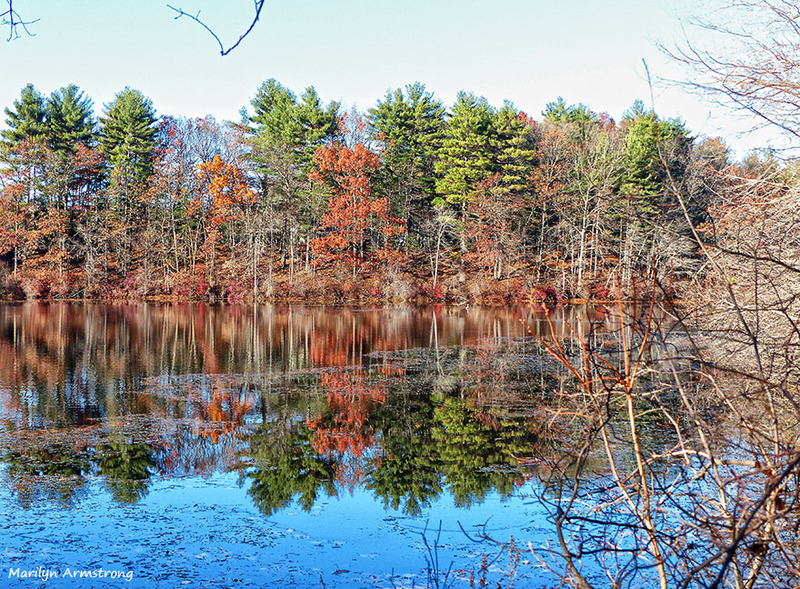 Before the rain started in October, you could walk across Whitin’s Pond. The ponds are full again. Full of water, full of ducks. I’ve never seen so many ducks. 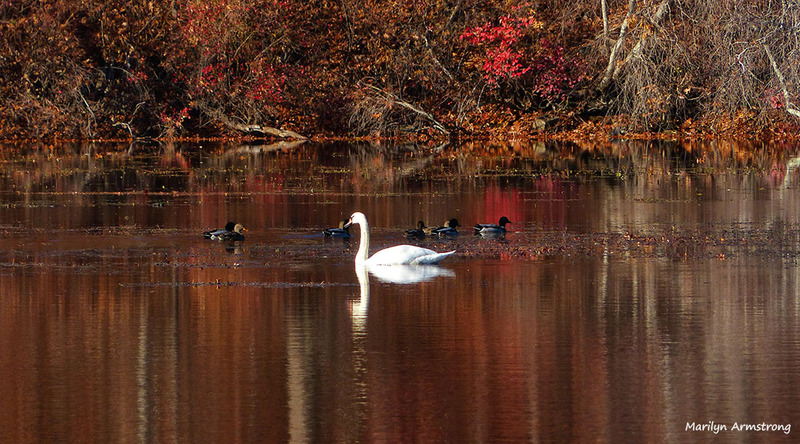 And today, down by Lackey Dam, one swan … and a lot of ducks. 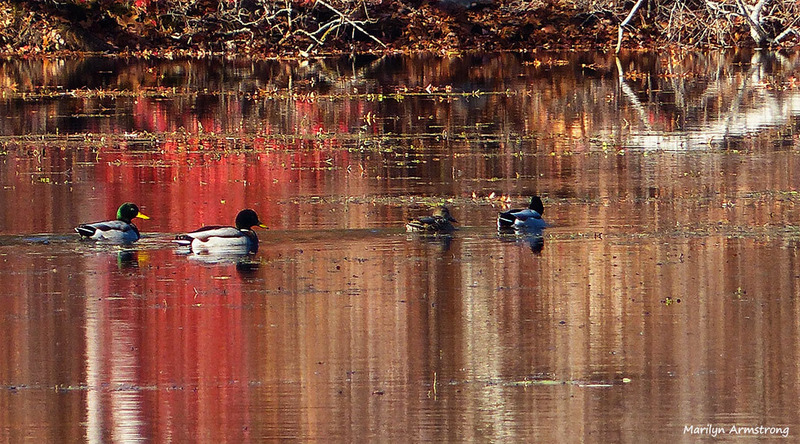 The leaves around the pond are dark red to bronze and so, by reflection, is the water. A fine day for waterfowl. During my visit from Liz, my photography student yesterday, Paul commented how the leaves in our backyard were falling like snowflakes as the three of us stood there watching them come down. It took a cold snap then sunshine to bring down the weighted leaves. Trees are looking barren now compared to the indian summer we had this year. It was beautiful! It’s raining again here, so I think I can safely say the pretty part of Fall is over and now it’s just a countdown to winter. For which I’m totally unready. It’s like a duck parade 🙂 And all those different ducks, proving tolerance works, at least among ducks. Ducks are, apparently, very easy-going. People could take a lesson from them. Nice photos. I think all of the swans are on the Cape. There’s a pond in Harwich that has more than a dozen and a mile away, on Swan Pond in Dennis there’s a family of 5 gracing the waters.. 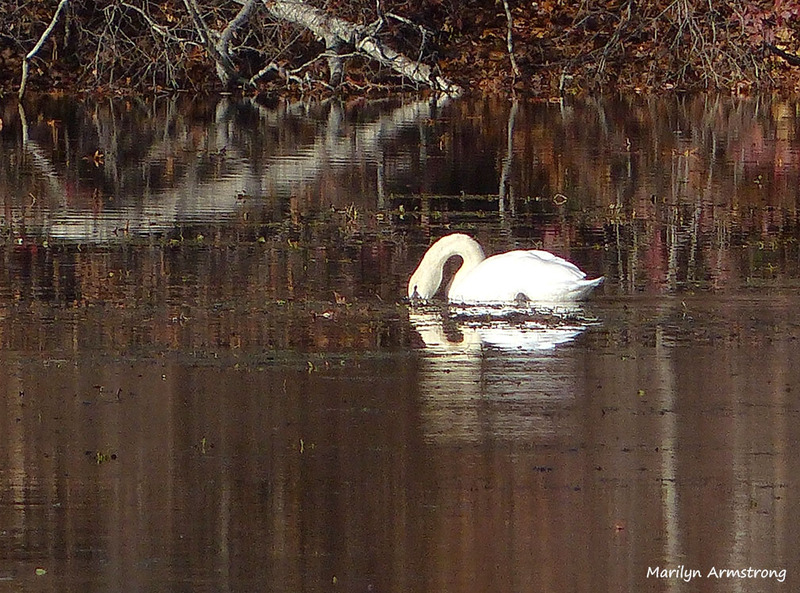 Yesterday I took a walk not too far from you, on the rail trails in Milford, MA and saw a pair of swan in a small pond I passed. I’m glad they survived. I believe I was right and they went to places where the water was still deep enough to swim and of course, there was food. I’ve seen a few locally now, so maybe next year, weather willing, they will be back in the valley. Such a gorgeous day you had for photography. Gorgeous reflections! Thank you. It was beautiful. Today it’s nasty and wet and rainy, so it’s good we had a few nice days!